It’s amazing how quickly little people develop their unique personalities. The changing and developing palates of toddlers makes way for a vast new world of flavours to explore! 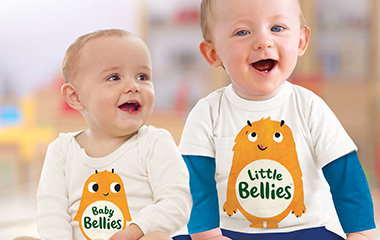 At Little Bellies, we know how difficult it is to find on-the-go toddler food that is convenient, yet free from added sugars, salt and a long list of unnecessary ingredients. Our ‘Toddlers in Training’ range (for little humans 1-3 years) is made up of delicious certified organic toddler snacks with more adventurous flavours, shapes and textures than our ‘Tasty Textures’ and ‘More to Explore’ ranges, to satisfy their developing palates and digestive systems, growing tastes and inquisitive minds. It’s toddler food which supports the transition from baby to toddlerhood (which often happens all too fast!). Part of the fun of experiencing toddlerhood with your little person is in watching your child explore and learn. It’s in the magic they experience embarking on new adventures with gentle guidance and support; with laughs, tears and tumbles along the way, as they discover ways to navigate and understand the world around them (or just the stairs to begin with!). It’s never too early to instill healthy habits and encourage a healthy and active mindset. Little Bellies’ certified organic toddler snacks make eating fun, and are an easy way for your tot to get wholesome snacks while on their latest adventure! They’re perfect for on the go, especially when you have a troublesome little fussy eater! Many parents admit to us to that they give their toddlers snacks to keep them quiet and entertained. There’s absolutely nothing wrong with this. Instead of buying into the negative perceptions around snacking, we like to focus on healthy snacks. Whatever works for your lifestyle and your toddler, is the best option for you. In between solid meals, our certified organic baby food are the perfect way to feed your little one- guilt free! And if this gives you more time and energy to relax; even better. You’ll be better prepared for the next adventure with your toddler! From 12- 18 months, your little mini-me may have a seemingly insatiable curiosity – and appetite! By this age, he is probably standing and walking, he may be able to put simpleshapes in the correct box, choose his own little outfits, and has probably begun speaking. He may also be munching on mostly solid foods, and doing a lot of self-feeding. This is where organic toddler snacks can come in handy. Our certified Organic Fiddlesticks are easy-to-eat dissolvable toddler snacks. Their stick-like shape helps toddlers develop more complicated motor skills. They also contain no added sugar and no artificial nasties but still have enough flavour for curious little mouths. From 15-24 months, your little explorer may be talking a lot, and may even be imitating you (lucky you!). At this age, they may be starting to understand simple directions and playing with toys much more imaginatively. They are also becoming incredibly social; they will happily socialise and may want to play in small groups. This is also the stage where their imagination is really beginning to come to life; your little one will love getting lost in music or a story with lots of pictures. Our Organic Animal Biscuits are the perfect way to turn feeding into an imagination-led learning experience, which can help with a fussy eater who loses interest in eating quickly. By naming and talking about the animal shapes of the biscuits, or creating a story, your curious toddler may start to embrace eating as a fun and positive experience, full of wonder. Or, use our delicious Organic Sultanas as an introduction to counting, and as a way to practice and develop that developing pincer grip they’ll need to hold the tiny sultanas. They’ll love the sweet, fruity taste of the sultanas and it’s easy to count just how many they have gobbled down! Many parents worry about the “terrible twos” but in truth, the 24 months+ period is a time that is full of wonder and excitement, a time where your little person will be testing boundaries and learning what to do (or what not to do!). Every day is an exhausting, yet exciting journey of self-expression, growth and learning. We believe in encouraging all little people to grow at their own pace, in their own time. Toddlers love copying everyone around them, so leading an active, healthy lifestyle by example is the perfect way to encourage healthy habits, as well as develop coordination and cognitive abilities … plus it’s fun! Little Bellies’ ‘Toddlers in Training’ range is a delicious array of certified organic toddler snacks which challenge your tot to discover new foods in a fun and non-threatening way, perfect for toddlers on the move! To find out more, click here.